It is true he qualified his remarks by stating that he would defer to the views of his defence secretary, James Mattis, and CIA director, Mike Pompeo, both of whom have said they would abide by the existing prohibition, and it is true there would be formidable political and legal obstacles to overturning the ban on torture. But it cannot be denied that the moral and operational case against torture has been dealt a heavy blow. Torturers worldwide can claim Trump has said torture is acceptable and it works. Trump’s remarks on torture are part of a wider onslaught on the system of international human rights principles and structures that developed from the horrors of the last century. This does not seem to me to be something that can just be laid at the doors of politicians and commentators on the right. Too often they have been aided and abetted by those who claim to be progressive but are impatient with the compromises, slow progress and ambiguities that are the landscape of international human rights development. Just when the need for credible opposition to torture could hardly be greater, here in the UK along comes Phil Shiner. Let’s be clear, Baha Mousa was hooded, beaten and assaulted by British troops in Iraq in 2003 to the extent that he died. One of those involved was found guilty of inflicting inhumane treatment and the Ministry of Defence and regiment concerned were severely criticised in the official inquiry that followed. Phil Shiner was instrumental in uncovering what happened to Baha Mousa but has now been struck off as a solicitor as it became clear that he subsequently led hundreds of claims against British troops that have been proved, to the criminal standard of beyond reasonable doubt, to have been dishonest. Specifically, witnesses were paid to change their evidence. Quite apart from the distress this must have caused to those fraudulently accused, Shiner’s dishonesty has led to entirely predictable calls that the UK should derogate from the ECHR in times of war – precisely, you might think, when the ECHR was needed. Shiner has not been the only human rights champion to fall this year. In a very different way, the death of Sir Nigel Rodley in January robbed the human rights movement of one of its doughtiest opponents of torture. Amongst many other roles, Sir Nigel had been the UN Special Rapporteur on Torture, chairman of the UN Human Rights Committee, drove the development of the Essex Human Rights Centre and remained active in many human rights organisations. Principled, self-effacing and effective, he leaves a huge gap although the example he set remains. Each State Party shall undertake to prevent in any territory under its jurisdiction other acts of cruel, inhuman or degrading treatment or punishment which do not amount to torture as defined in article I, when such acts are committed by or at the instigation of or with the consent or acquiescence of a public official or other person acting in an official capacity. In particular, the obligations contained in articles 10, 11, 12 and 13 shall apply with the substitution for references to torture of references to other forms of cruel, inhuman or degrading treatment or punishment. That requirement should be born in mind when considering the latest safety in prison statistics produced by the National Offender Management Service for England and Wales at the end of January. Inhuman and degrading treatment may be the result of neglect as well as deliberate acts. You can take your pick of what is worst from the accelerating rates of death, suicide, self-harm and assault in prisons in England and Wales. The suicide and assault figures are what get most attention but for me the most disturbing figures are the overall death rates. 354 people died in English and Welsh prisons in the year to September 2016, up 32% on the year before. The death rate from natural causes per 1,000 prisoners has more than doubled in the last decade from 1.1 per 1,000 in December 2007 to 2.3 per 1,000 in December 2016. It is true that the prison population is getting older and so in the natural course of things you would expect the death rate to increase. But 32% – in one year? It seems to me that there is a strong case that this might be evidence of inhuman or degrading treatment at the very least. But the question has gone unasked. In fact, the increase in the overall death rate has gone almost entirely unremarked. The situation in England and Wales is hardly unique. If you were feeling pessimistic, you might take this as evidence that nobody cares very much what happens behind prison walls at all. 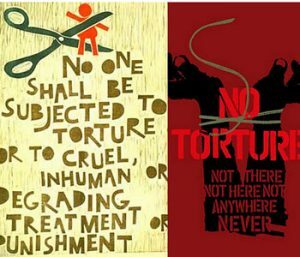 Just as the torturers may feel encouraged by endorsement from the top, the losses and self-inflicted wounds of the human rights movement and the systemic complacency and neglect evident in too many places of deprivation of liberty, so those concerned to prevent torture could be forgiven for feeling discouraged. Understandable though that might be, it would be wrong. This is the time when those opposed to torture need to be redoubling their efforts. That means speaking out individually, supporting the work of the NGOs working to prevent torture and ensuring accountability for perpetrators and support for victims when it happens, and using all the legal mechanisms at our disposal to oppose it. It should also mean ensuring the bodies with a mandate to prevent torture are fit for purpose. The Optional Protocol to the Convention Against Torture (OPCAT) established a dual system of international and national independent preventive visits to all places of deprivation of liberty undertaken by the Sub-Committee on Prevention of Torture (SPT) and National Preventative Mechanisms (NPMs) respectively. As these bodies mature and the number of NPMs continues to grow, vigilance is needed to ensure their mandate is respected by the states concerned, continued efforts are required to ensure NPMs have the training and support they need, and NPMs themselves are transparent in demonstrating they operate with rigour and professionalism. Primary responsibility for this rests with the SPT. There are also a growing number of academic institutions, including the Human Rights Implementation Centre at Bristol and the School of Law at Royal Holloway University of London, where I am based, that offer practical support and research. The Association for the Prevention of Torture’s (APT’s) training and guidance are an essential resource. The Council of Europe and other regional bodies provide funds and support for NPM development. In addition, it seems to me that it is reasonable to want reassurance that NPMs are up to the challenges they have – that they do not allow their independence to be compromised, that they operate professionally and that they are effective in their task. For this reason, I welcome the establishment by some of the most respected figures in the field of torture prevention of ‘NPM Observatory’ or ‘NPM Obs’ an association based in France that aims to provide objective but constructive assessment of NPMs in Europe. NPM Obs still has a long way to go before it is fully established, and needs to do a better job explaining itself to NPMs and other actors. Nevertheless, I think NPMs that are confident about their role and independence should welcome objective external scrutiny and, bearing in mind the damage done by the failure of some human rights organisations and champions, welcome constructive challenge of those NPMs whose performance or lack of independence might damage the NPM ‘brand’ as a whole. NPM Obs ‘assessment’ function means it has a very different role to play from the pre-eminent mandate of the SPT in undertaking preventive visits, assistance and advice or the training and support provided by organisations like the APT. All these functions are necessary and should be complementary. If it is true that the torturers feel emboldened and states feel less obligation to prevent cruel, inhuman or degrading treatment, it seems to me that this is a time when we must step up our efforts to ensure that the mechanisms that should stand in the way of torture and ill-treatment are fit for purpose and have the encouragement and support they need to succeed in the struggles that lie ahead.